The artist Sergei Solomko (1867-1928) grew up in the Konstantinovich Palace in Strelna where his father was in the service of Grand Duke Konstantin Nikolaevich. 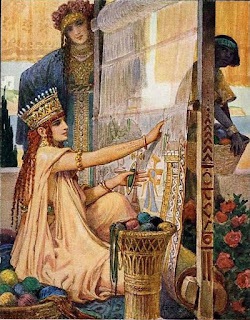 Solomko was a prolific artist and famous for his historical watercolors, book graphics, jewellery and costumes. He created models for the Imperial Porcelain Factory, Fabergé, and sketches of Old Russian costumes for the 1903 Winter Palace Ball. In December 1908, Empress Alexandra sent her brother, Grand Duke Ernst of Hesse-Darmstadt, a postcard of Solomko’s painting ‘Rencontre’ (below). Empress Alexandra hung a large number of paintings in her apartment on the 2nd floor in the Winter Palace, many purchased by her and Nicholas at art exhibitions. 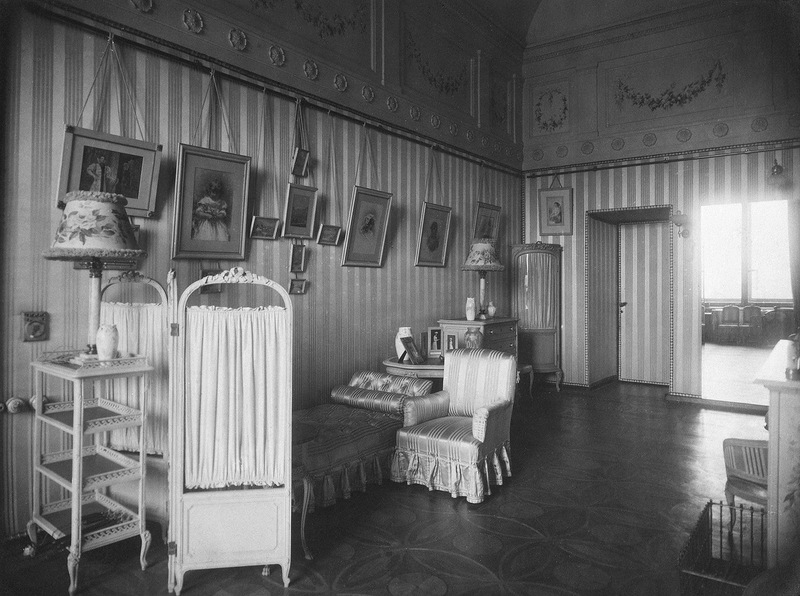 In the photograph (below) of Alexandra’s boudoir in July 1917, I believe the painting of a man in an old Russian costume, visible on the left above the lamp, is by Solomko. There are no archival inventories discovered as yet to confirm my identification of the artist, the date of purchase, nor where the painting is now. Can you help to prove the photo shows a Solomko painting and its location today? 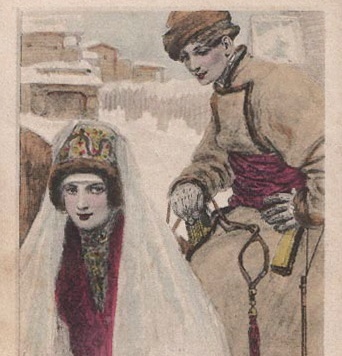 I can tentatively confirm that Solomko is the artist by a couple of post cards in my vintage Russian art post card collection. I do not have the identical paintings, but similar enough to either have been done by Solomko or a fraud. Interesting; I'd never heard of this artist. Thanks! Zooming in on the picture on the left in Alexandra’s boudoir, I wonder whether two pictures were combined in one frame. Could it be that these are studies for costumes designed by Solomko for the 1903 Costume Ball – a man standing on the left side, and a lady wearing a 3- or 5-pointed kokoshnik seated on a high-backed chair on the right side? In the 1899-1900 photo album of the boudoir, there is only the right side of the frame showing, yet it looks a similar frame. It is probably easy to confirm with other albums in the archives or inventories. The 1917 photos from July and November are not necessarily what was in each room, things had been moved around. Incorrect Date of Birth of Grand Duke Alexei A.